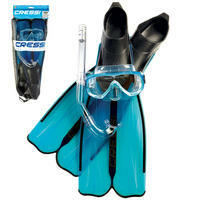 This set includes a pair of Cressi Rondinella Fins, a Cressi Onda Mask and a Cressi Gringo Snorkel. Please see below for a full technical description of each element. All of Cressi's fifty-year experience has gone into these fins, which are a modern revival of the successful principles of the glorious light blue rubber Rondine fins. This mix makes the Rondinella fins light and powerful: they are easy to use, not too demanding, and perform generously at the same time. The computer-designed foot is enveloping and anatomical, making it easy to put them on and perfect for extended use. Rondinella fins are perfect for snorkeling, free diving, and long swims.